“Dad, I know we can hike out of here”, said my youngest son, Graham, as I looked up at the grey sky, flecks of rain touching my face. He was 15, at the time, and there was real fear in his eyes and concern for me and his brothers. I hoped he wouldn’t see the fear in mine. I knew he was wrong, but I looked up at the cliffs around us , wondering if we had any options, as I listened to the roar of the upcoming rapids. I looked at the river racing by and wanted to sprout wings and just fly out of there, but, I knew there was no turning back. 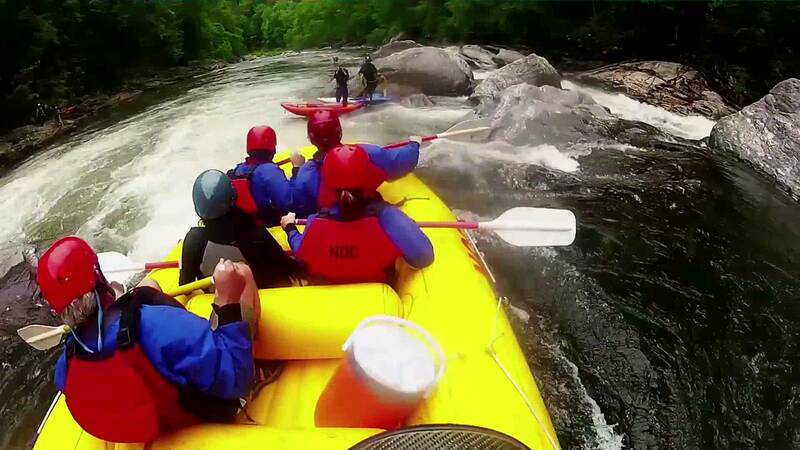 We were committed and there was only one way out of this – downstream and through the Five Falls on the Chattooga River. This river was made famous by the 1972 movie, Deliverance. In addition to making the song Dueling Banjos number 2 on the Hot 100 for four weeks (just behind Roberta Flack’s Killing Me Softly), that movie inspired a generation of new paddlers to “try” the river and virtually birthed the white-water rafting industry. That movie had some other quite memorable scenes (I never looked at Ned Beatty the same) and who could forget when that hand, holding a shotgun, burst through the water surface in the dream sequence. That movie was memorable on so many levels. It was a rainy day in June of 2003, following one of the wettest springs we’d had in a long time. We had hit the road early for the Chattooga River and a day of rafting. My three sons had all chipped in to take me on a rafting trip down this famous river for my 45th birthday. I thought it would be a lot of fun for us to experience this together – you know, as MEN. Sort of a “Wild at Heart” experience that we could share together. My oldest son and I had done this trip the summer before, during one of the driest summers we’ve had in years. That summer some portions of the river where so dry we had to get out of our raft and drag it along. On one of the falls in this section it was so dry that our raft basically folded in half as we “scooched” our way through the V in the rock and our guide literally landed on top of us as we “fell” down the falls. That would, however, not be the case on this trip. We had come to run section IV, the last seven miles of this scenic river and the most challenging with class III and IV rapids (and one class VI that, thankfully, the state of Georgia would not let “civilian” paddlers run). With excitement and a little trepidation we picked out our helmets, paddles and life vests and listened to our guide, Youngblood, tell us what to expect in his “sing-song” California dialect that ended every sentence with an up note and a question mark. It would be the four of us and our guide in our raft and there were four or five other groups with us on this trip. As we made our way down to the water we “met” an 80 year old woman who would be in the raft in front of ours. “This can’t be that hard”, I thought as we pushed off and took our place in line. As we passed under the Route 76 bridge I barely noticed that the water level was up 1.5 feet above normal. Just under the bridge we were caught up in the current as the grey sky began to drizzle a light rain and we headed downstream. There seemed to be a problem at this point, however, as I slowly worked out what had happened. I realized that I was under the water with my paddle firmly in hand, and I needed to figure out where the surface was and then try to remember how to get there. When I finally made a decision to break the surface of the water, my son Daniel was holding onto the side of the raft near me and yelling at me me in a slowed down, deeper version of his voice. “Aaarrrre youooooo okayyyyyy?” he said, as I stared at him wondering why he was talking that way. I reached for the raft but couldn’t seem to connect and Daniel grabbed my life preserver and pulled me in closer. What I didn’t realize at the time was I had experienced Torso Reflex and I was barely breathing, much less communicating. According to lifesaving professionals, Torso Reflex is caused by immersion into water colder than 70 degrees. It triggers an involuntary, reflexive torso gasp “that can cause the person to aspirate water into his airway and lungs, which can lead to disorientation, panic and the loss of any physical ability to swim or remain afloat.” I was all those things and more. There was some guy in a kayak yelling at us to let go of the raft and swim to shore, so, paddle still firmly in hand like a kid’s blanket, I did the best I could to follow his directions. At the bank I dragged myself out of the water and sat down still dazed and unsure of why I was feeling that way. The river guides had decided we would break for lunch and, surprisingly, none of them talked to me – they seemed to even avoid me, (That is probably just my dazed memory) as we all sat down to our sandwiches and thoughts of what was next on the river. After lunch, we put back in the river and headed for the most difficult section of this run. Past Stekoa Creek and Long Creek Falls. Past Deliverance Rock and Raven Chute and down to Camp Creek beach – the beach Graham and I were standing on when he said, “I know we can hike out of here.” Camp Creek is the highwater take out before the Five Falls. I learner later that there is a trail that leads out from there and is the last chance to turn back. Since no one offered us that option, and since none of us were willing to ask if there was one – we all stood there, heads down, and listened as the guides loudly and seriously explained just how easy it was to die in this next section of river. We heard, again, their warnings like, “let go of your paddle”, “swim towards the bank as fast as you can”, and my favorite, “if you miss the last safety rope there is no other option than to go over the next fall on your own.” We loaded up the rafts and reluctantly completed our journey – past falls with names like First Ledge, Cork Screw, Crack-in-the-Rock and Sockem Dog. I held my breath through each one and we finally landed in the aptly named Deadman’s Pool. I’m thankful for my stories and the memories I share with my wife (she can tell you some sailing stories), my sons (who lived to tell the tale of the Chattooga River) and my beautiful daughter. (By the way, we rented the movie on the way home and my boys were justifiably horrified) I’m also looking forward to the stories to come. August 4, 2015 in Facing the Truth, Family, Fatherhood, Wake-up calls. Tags: Drama in Real Life!, Life Rafts, life together, love, Love my family! Great story. My sister and I went down the Chattooga sometime back in the mid 70’s. Loved and thankful to have lived to tell the stories. Thanks for the great reminder. So true, Mike, and glad to know you and your sister lived to tell! there is nothing like that feeling of I’m not in control anymore, help me Jesus!! Dude,shoulda been paying more attention when Youngblood was giving the water spider lessons up river! Freak-y. Please remind to avoid the involuntary ‘torso reflex’. That is amazing. One friend of mine calls this Type 2 fun. With Type 1 you know you are having fun and enjoying it. With Type 2, it takes a few days to settle in and then the memories grow sweeter with time. Thanks for your reply. Nice. It’s funny how some of us have that ‘need for speed’ or at least that desire to push things to some crazy levels. I’m just glad that at some point in our lives, self preservation starts to emerge and those other needs start to diminish. Between my 2 brothers and I, my mother recently reflected and counted 22 trips to the emergency room that resulted in broken arms, legs, ribs, a cracked skull, crushed eye socket, one broken back, a few concussions, a 17 month stint in a wheel chair, collectively over 30 days in the hospital, and lots and lots of tears . . . Not to mention all of the totaled cars and motorcycles. But, and we were all proud no say, there were never ant broken spirits. Ain’t God just soooooo good!? George – that is so true and funny! If I shaved my head there would be a story to tell about every scar. I put my mom through it too. Our sons did the same 🙂 It’s been nice raising a daughter last – way less trips to the emergency room. Several years ago my husband and I were faced with a decision – do you want a home or do you want a life? We chose life and it has been the best decision we ever made. Being female I object to the William Braveheart comment about men. It applies equally to women. In my experience women too love to push the edge, to find out what we’re made of, experience the adrenaline rush. No one gets out of here alive, not men, not women, and the closer I get to the end (though I think I’m still good for another twenty years or more) the more interested I am in really living. And the end can come at any time, we just don’t like to think about that. Thanks, Alison. William Wallace said that, of course, in the context of where he was standing at the moment. It definitely applies to “mankind” and I certainly never intended to offend the ladies. Enjoy your adventure to the fullest!